Alex Ovechkin’s first goal of the game against the Sharks last night passed Dave Andreychuk on the all time career NHL goal scoring List. The first goal was Ovechkin’s 641st goal for this career and gave him sole possession of fourteenth place in career goals. He added two more goals for the night and now has 643 goals for his career. The next player on the career list is Brendan Shanahan who has 656. He is now just 14 goals away from passing him. Here is the goal which broke the tie with Andreychuk. It occurred 10:41 mark of the first period, on assists from Nicklas Backstrom and T.J. Oshie. The goal tied the game at 1-1. 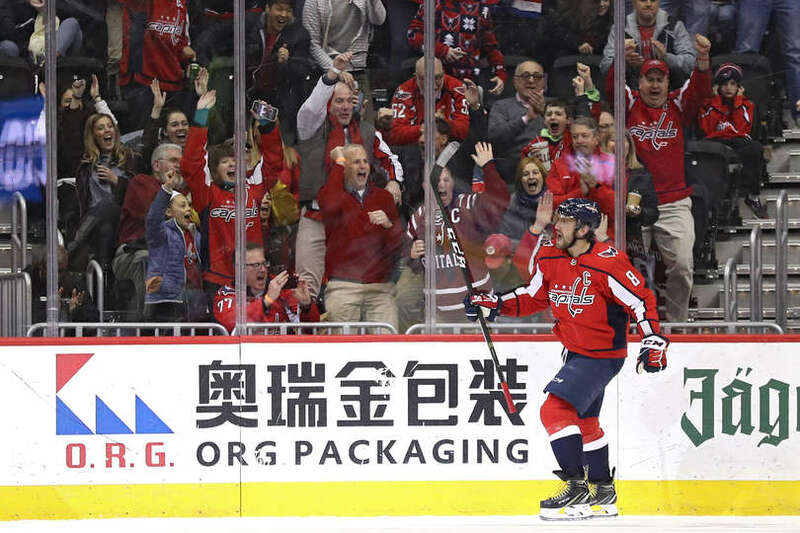 Ovechkin now has 36 goals for the season and leads the NHL. He also got his 23rd career hat trick which propelled him ahead Teemu Selanne (22) and into a tie with Jari Kurri (23) for the 10th-most in NHL history. This entry was posted in News, Washington Capitals and tagged Alex Ovechkin, Brendan Shanahan, Dave Andreychuk. Bookmark the permalink.